These are photos I took of my co-worker's desk and chair. My co-worker fancies himself as a bit of a "health nut". He has remedies and cures for nearly everything. (Don't ask to see how moles are removed... it's worse than being asked to smell someone's cast). Suprisingly many of his cures work (for him). My problem has always been accepting his health advice. It's difficult for me to take advice from someone who EVERYDAY eats ONLY cake, high-calorie donuts, 5lb containers of Sam's Club Animal Crackers or heaping bowls of ice cream for lunch (in addition to his desk-top pharmeceuticals). In the nearly three years I've worked with him I've never seen him eat anything nutritious. Yet when anyone in the office orders a cheeseburger from McDonald's LOOK OUT!!!! He'll verbally assualt you with the many manifestations of diseases taking host in your body at that moment. His tirade will continue throughout our entire lunch but only between bites of his donuts and cookies. 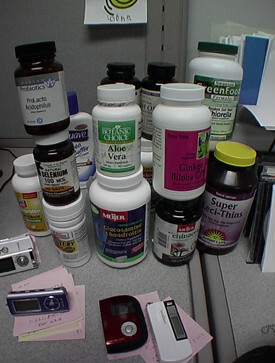 Anybody who has that many 16MB MP3 players laying on his desk obviously can not be trusted for medical advice. I'm glad you noticed all the MP3 players. I was going to comment on that too but, was saving it for another post. I guess I'll comment now. My co-worker is adamantly "anti-pod". No matter how much prodding we give him to get an Apple ipod he won't budge. Instead he goes out and buys another 16mb MP3 player. With as much as he's spent on those MP3 players he could have bought at least 3 ipods. Moral crusaders are a selfish bunch aren't they. I find it interesting that ground beef and cheese is compared to donuts and ice cream, but then again anything can happen in this world today. It seems your co-worker has some bad habits that you can not deal with, and perhaps he should! Someday he may be able to break his addiction to those unhealthy foods. You perhaps the cheese burgers and fries if you eat those, as well as your imaginary cigarettes and imaginary nicotine patches. Perhaps his desk-top pharmeceuticals help to keep a healthy attitude. Should people eat cheese burgers or cakes I don't know. But while I ponder these thoughts I will enjoy a chocolate covered dounut or maybe two chocolate covered donuts to boost my immune system from all the crap life throws our way. Oh and by the way I don't think they ever made 16mb MP3 players. 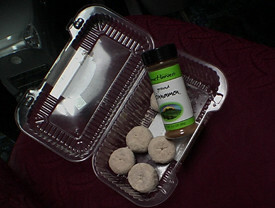 Interesting span of ingestible items - healthy, sugary and fatty. Maybe we could see a pyramid of how all of this SHOULD look???? Cool, a human experiment! Which will cause his desk to collapse first? The pharmaceuticals or mp3 players? Seriously, though. There's a basic misunderstanding of value here. I'd say more but it's so comical to watch I'd hate to induce change. However I would be willing to down my first fast food burger in many, many, many years along with all the accessories that come with it just to drive him nuts. -Then I'd promptly challenge him to a 5K, which I would run smoking red licorice and listening to my iPod. Sell those mp3's on Ebay! The profits would bring you one step closer to the Mega-Jumbo, Navy Seal, Ultra-Fit, 500lb. mix of Sterol, Zero Carb Isopure, Myolpex Protein shake powder (vanilla flavor) at Sam's Club. Your comment generated a very healthy projectile belly laugh!! !